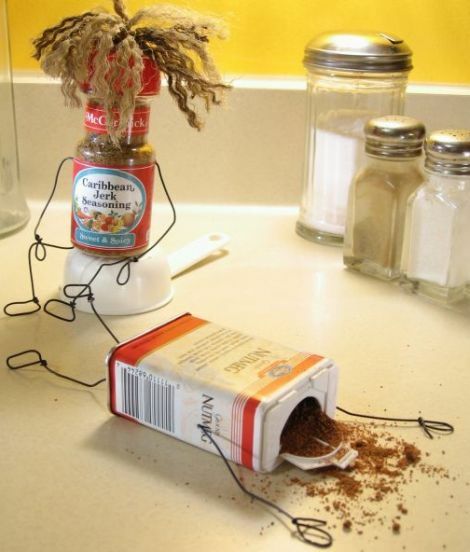 i need to show you these very funny little sculpture vignettes from indiana artist terry border. 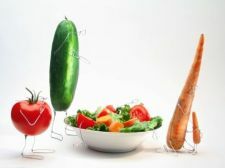 he crafts each piece from food, found objects and wire. i can’t decide if the objects themselves are funnier than the photos, or vice versa. 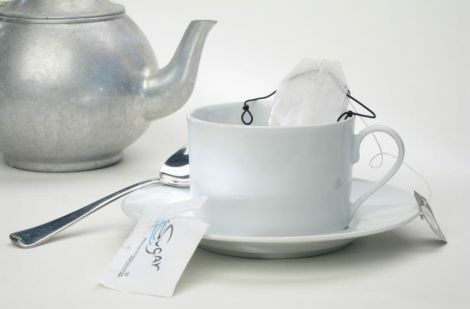 terry was a commercial photographer before his hobby of making mobiles and other whimsical things out of wire took hold. i’m so glad he’s blended his two expressive art forms. i think i like “relish life… and death” the most. check out his blog, see his larger pieces here, and while you’re at it, stop by his etsy shop too! 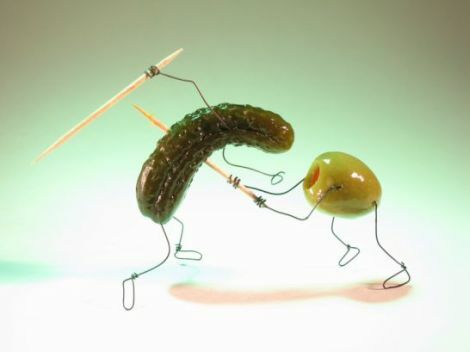 wow, i thought for sure the gherkin would take the olive, so i guess i lost that bet! they don’t call it the evil olive for nothing. Gigi you really do hunt out the BEST stuff! These are really funny but also amazing for the nuanced expressions they have. And he can do it with a little bit of wire and a vegetable! i know — aren’t they great? the more you look at the photos, the more detail and emotion you find. he only has one piece in his etsy shop right now and i hope he’s making more! i think we need to start a petition to get him to sell these prints to us!!! i’m crazy for these and want them hanging in my kitchen, so i can laugh my head off everyday. outstanding find! Gigi thank you so much for finding these for me! 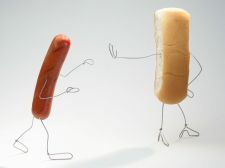 Surrealist whimsy meets Theatre of Object: I love it! sounds good to me sosser! how are things in oz? glad you like the photos — i think they’re a blast! These are hilarious! 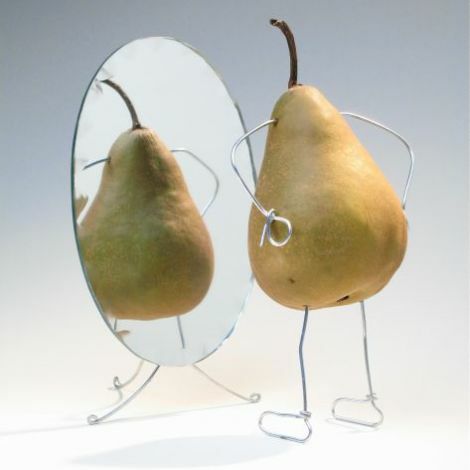 I especially love the pear staring at the mirror. You can almost tell what it’s thinking! Very well done!! I am a Chef and I have just thought of a new pass-time! glad you liked them too — they are so funny! i imagine since you are surrounded by food all the time, you will be whipping up some elaborate food photo shoots and stories. have fun! Those are fun, I hate olives so I hope it gets its comeuppance. This was a day-brightener. And, seeing that it’s about 40 minutes before midnight, an overdue one. thanks for the comment — you are too funny! are you in the midwest too? I know exactly how that pear feels. thanks for the laughs and the comment, miranda! i think we’ve all been there with the caribbean jerks. it looks like the nutmeg has lost his mind! I know just how that pear feels! Fat, fat, fat. pic2: Tony Montana in his bath from scarface. pic4: take any treasure huting fantasy movie. pic6: Skyler after his brain feast from ‘Heroes’. nice insight! they do look like detached observers at the scene of an accident! the jerk is sticking his foot out and is tripping the nutmeg, whose nutty brains have spilled out everywhere. is that what you don’t quite get? They are very good. Sure put a smile on my face. these are fun, aren’t they? click on the link to terry’s website in the article to see even more funny stuff! I love this guy. James Thurber, George Lucas, Joan Miro and PJ O’Rourke put together! wow! what an impressive creative combination of people! nice call. terry currently has a book in development that is scheduled to be released sometime next year (2009). if you click on the link in the post and head over to his website you can get on his mailing list for info about it. I’d love to get on that list. Would Mr. Border want to try with some native Philippine food? We have bitter gourd (Amplaya), star fruit (Balimbing), spiny smelly breadfruit (Durian), native jackfruit (Langka) as big as half a sack of potatoes and similarly shaped. Wow, amazing blog format! How long have you ever been blogging for? you make running a blog look easy. The total glance of your web site is fantastic, as neatly as the content material! Great article, thanks for sharing that!!! What’s up to every , since I am actually eager of reading this weblog’s post to be updated regularly.